Whether it be for getting together, having fun, team building or a conference breakout activity SegWestlympics are a great way to have a memorable outdoor experience that will leave your team or clients talking for months. Our SegWestlympics are designed as a team building activity to give everyone the opportunity to participate where the competition can be as keen or relaxed as you choose. This is a great way for your corporate team or company clients to get out of the boardroom and have a memorable outdoor experience on a SEGWAY together. As the activity progress, so does the level of skill required to complete the tasks, and teamwork is essential to win challenges and gain points. IT IS THE MOST FUN YOU CAN HAVE ON TWO WHEELS AND IS ALL DONE STANDING UP! From rides to races, this fantastic team building experience will stand out as one to remember! Normally conducted at the Novotel Vines Resort we are more than happy to discuss another venue, whether it be in the Perth metropolitan area or the WA southwest . 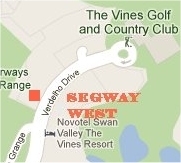 We will deliver the Segway PT's along with experienced staff members to your function. Once there, we'll teach your group how to ride the Segway PT and encourage them to have some fun. Starting off easy, your team will have time to discover how these remarkable machines work. There is nothing that compares to riding a Segway PT, so this is a thrill that everyone will enjoy. As the session progresses, there are a range of activities we can include adding even more excitement. Head-to-head relays build trust and self-confidence among group members, while our staff officiates and keeps score. A Segway PT experience is such a unique and exciting activity and will be a team talking point for months and years to come. Copyright © 2016 SEGWAYWEST. All Rights Reserved.